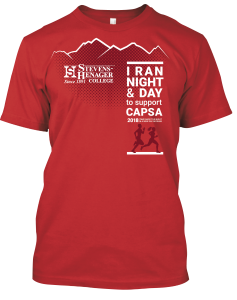 This year, CAPSA is hosting two 5K’s. The first will be held on Friday, May 11 at 7 p.m. The second will be Saturday, May 12 at 9 a.m. 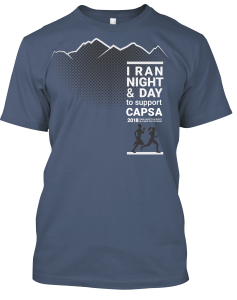 Individuals can choose to participate in one or both runs to show support for CAPSA. Both runs will begin at Willow Park Center Stage, and there will be food trucks, music and a fun atmosphere at the race finish line. Unlike previous years, CAPSA employees & volunteers will not be timing your run. If you’d like to time your run, please bring a watch or use an app such as Pacer. T-Shirts are only available until April 20. Below are two ways for your company or organization to support CAPSA and participate in this event. 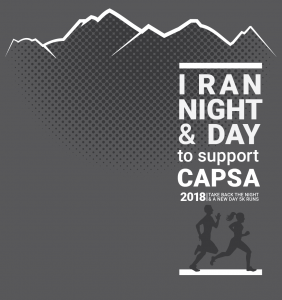 Support CAPSA and make the CAPSA 5K a company/ team building activity. You can receive a special version of the shirt for your company or group. Purchase 20 spots and receive a custom shirt (select your color and have your logo or name displayed on the front). The cost is $25 per participants. Contact James Boyd or Katie Stringham at (435)753-2500 or events@capsa.org to sign your group up. CAPSA is focused on making partnerships that are mutually beneficial by creating an event that you are proud to support and look for creative opportunities to generate a positive ROI. By sponsoring this event you will interact with over 600 participants. If you want to sponsor the run, please contact James Boyd at 435-760-5277 (cell) or james@capsa.org. Waiver and release statement: (by registering, you agree to the following statement) I know that running and walking a trail race is a potentially hazardous activity. I should not enter unless I am medically able and properly trained. I assume all risks associated with my voluntary participation in this event, including but not limited to, falls, contact with other participants, the effects of the weather, including extreme temperatures, traffic and all conditions of the road, all such risks being known and appreciated by me. Knowing these facts, and in consideration of your accepting my entry, I for myself, my heirs, executors, administrators, or anyone else who might claim on my behalf, covenant not to sue and waive, release, and discharge CAPSA , all sponsors, and workers/volunteers for any and all claims or liability, whether forseen or unforeseen, for death, personal injury or property damage arising out of , or in the course of my participation in this event. I further grant full permission to the above mentioned sponsors and organizers to use any photographs, videos, or other recordings of the event for any reasonable purpose.